Treachery has a price, in this mesmerizing thriller from the New York Times–bestselling writer. 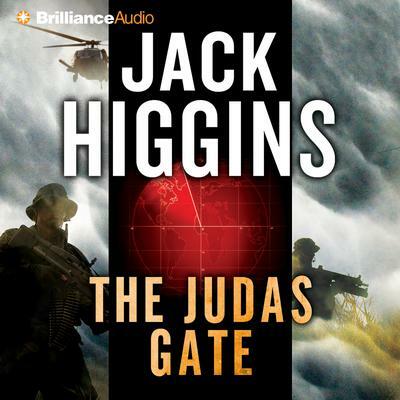 With his latest novels, Jack Higgins has showed himself “on top of his game” (Publishers Weekly), his books infused with “a timely edginess [that] pulls you along like the surprisingly strong current of the Thames River” (Associated Press). The Judas Gate is just as timely—and just as surprising. A disturbing audiotape has made its way to General Charles Ferguson, adviser to the Prime Minister, and from him to the President of the United States: battlefield chatter from an ambush in Helmand province, Afghanistan, in which twelve U.S. Army Rangers and a British medical team died. Most of the Taliban voices are Afghan, but not all of them—shockingly, some of them are British, and one in particular, the voice of the commander, bears an Irish accent. The idea that one of their own could be responsible for such a massacre is appalling, and Ferguson immediately puts Sean Dillon in charge of hunting the traitor down. But Dillon has his own way of doing things and, he will eventually discover, so does his quarry. Not only will Dillon be going to war—the war will be coming to him. Filled with suspense, driven by characters of complexity and passion, The Judas Gate is an unforgettable novel by the man “who has produced some of the best suspense fiction of the past fifty years” (The San Diego Union-Tribune).